2011 wasn’t a fun year for small business, but food and drink in Scotland continued to make advances with impressive new products, new producers, new markets, growing food festivals, and an increased awareness of the value and importance of local food among consumers, chefs, schools, community groups and even policy makers. Not all the foods and producers highlighted here are strictly new this year - setting up a business can be a drawn-out affair for many reasons - but they all came to prominence on the national food scene in 2011. As ever, The Larder prefers to focus on the country's smaller operations, as we believe that's where we find the most interesting stories as well as the greatest commitment to quality, authenticity and local connections. Here we profile Highland salad-growers Saladworx, cheesemakers Barwheys Diary from Maybole and Serena Errington from Lanarkshire, the Tombuie Smokehouse at Hardiesmill near Kelso, the plough-to-pint innovators at the Scottish Borders Brewery and Edinburgh marshmallow specialist Burgh Bakes. It was an act of neighbourly kindness that set Michelle Bowley on the road to success. She often took a basketful of the salads, herbs and edible flowers she was growing for her family to an elderly neighbour. An ex-AA man who was a bit of a veg grower himself, he suggested she might have a business worth cultivating. He was right. From that beginning, she was determined to grow the unusual and exotic edible plants that has made an impression with high-end chefs at places like Skibo Castle as well as local shoppers. Among nearly 90 varieties grown from seed are herbs such as sculpit, a wild yet mild flavouring for salads that hails from Northern Italy. Parcel (tastes like celery, but looks like parsley) is another. The salads grown in seven polytunnels on Mill Farm, just inland from the Dornoch Estuary, picked up a clutch of awards in 2011. Plans for 2012 include a push to places further south of SaladWorx’ Highland base, into Edinburgh in particular. 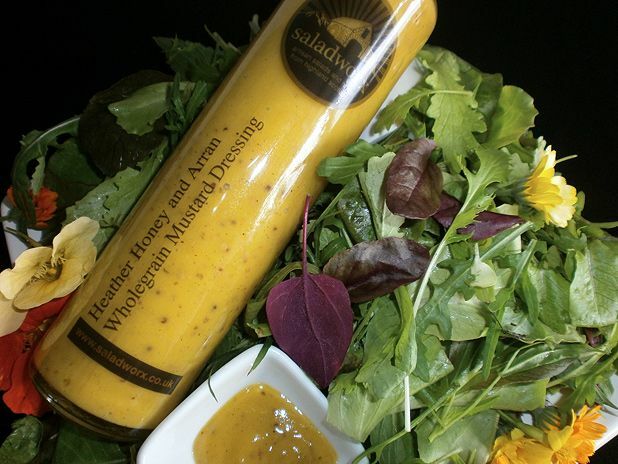 A range of rapeseed oil-based salad dressings is rolling out too, flavoured with Scottish ingredients such as heather honey, Arran Mustard and, continuing their spirit of fresh ideas, Hebridean seaweed. When John Henderson tired of his advertising career in London, he came back to an altogether different challenge in the Scottish Borders. Looking for something creative to do with the estate he had inherited just outside Jedburgh, he recognised that the malting barley grown at Chesters had potential for something unique, and might provide the estate with much-needed diversification. Brewing beer on the farm was a simple idea, but it took five years of wrestling with officialdom before Henderson's ‘plough to pint’ brewery finally opened in a converted farm steading. The first casks rolled out in February 2011. Now, young brewer Peter Sharp turns out three beers, twice a week, using barley grown on the farm and local water. His Foxy Blonde, Game Bird and Dark Horse are on tap in nearly 200 pubs; local ones, of course, but also as far north as St Andrews and down to Durham too. With an appearance on TV’s *Loose Women* and a beer-shaped crop circle attracting wider attention, John’s salesmanship is spreading the word far and wide. Two new brews are set to benefit from the buzz: a best bitter, Holy Cow, and in response to requests from rural pubs for a lower alcohol choice: a 3% abv Wee Beastie. Tricia Bey makes her hard Ayrshire cheese near Maybole, just three miles from the place where Robert Burns’ mother once did the same thing with her son, a little while ago. Bey’s cheese is hand-made from the high-butterfat milk of the same breed of Ayshire cows, in much the same way, give or take some stainless steel equipment. Hard-pressed, unpasteurised, wrapped in cheesecloth that allows it to breathe, turned every three weeks and taking a year to mature; Mrs Burns would certainly recognise the result. Pale, creamy, yet crumbly. It’s been a long haul to the point where Barwheys cheese has become a standard on at least four Michelin-starred restaurant cheese boards. Bey built her pedigree Ayrshire herd slowly from scratch, created a brand-new dairy, and has dealt with jack-knifed milk tankers on black ice – all difficulties overcome and an Ayrshire tradition proudly revived. We shouldn’t be surprised if this cheese from Burns’ heartland takes a place among other traditional pleasures on the night that celebrates his genius. An address to the cheese? Why not. Gourmet marshmallows might not fit the picture of your typical Scottish food, but Nicole Roberts’ hand-made, feather-light delights are examples of the fresh thinking and dedication to quality that creates more than just a passing fad. An English Literature graduate whose frustrations in local cafés convinced her to be her own boss, Roberts found initial inspiration from what imaginative New York bakers were doing with the humble marshmallow. With recipes created with good Scottish ingredients such as butter, milk, eggs and soft fruit, as well as fairtrade sugar, Roberts has taken the term ‘handmade’ at its most literal. Everything is made from scratch, from the caramel in the millionaire’s shortbread marshmallow to the mulled wine in her Christmas variety. It’s all very labour-intensive, with some flavours requiring up to 18 hours to set. The result is that flavours like fresh strawberries and cream, and key lime pie are quite unlike the very sweet, doughy-textured mass-produced marshmallow. Local Edinburgh delis, farmers' markets and craft fairs, coupled with plenty of social media buzz, have garnered fans. An online shop is making Burgh Bakes' creations more widely available, with one order already winging its way to a soldier in Afghanistan. Smoking can be a blunt instrument when it comes to food. In skilled hands, however, it can complement and enhance the original flavour of a product. Robin Tuke of Tombuie Smokehouse in the Borders took the latter route when commissioned to create a dish that would appeal to the great chefs of the world at the 2011 Bocuse D’Or culinary Olympics in Lyon. Working with Scotch lamb and a light oak smoke (plus a preserving process that remains top secret), he created Wisps of Lamb, thin slices which work with the sweet notes of lamb and leave no greasy aftertaste. Designed to be used in a salad, for example, the smoke is subtle and gentle, or as Tuke puts it rather more poetically: 'teasing the sides of the mouth, kissing the back of the throat'. Tuke and his wife Alison are well known for the pure-bred Aberdeen Angus cattle they rear on their Hardiesmill farm near Kelso, and the lamb takes its place on a growing list of meats (Robin is allergic to fish) getting the Tombuie touch. A Victorian-recipe pickled beef is the latest. Sweet-brined, it’s more like a ham in texture, ready to pot-roast. Local partridge is also going on the menu this season, and judging by Robin’s enthusiasm for exploring what happens when good game and meat meet a truly complementary smoke, it certainly won’t be the last addition. Good farming takes full advantage of seasonal gluts. Cheesemaker Selina Cairns and farmer husband David have done exactly that with the surfeit of sheep’s milk available from their flocks in spring and summer every year. This is now being turned into a hard ewe’s milk cheese called Cora Linn, named after a waterfall within the Falls of Clyde. Quite a departure from the Errington’s family’s well-known blue cheeses, it’s meant mastering the arts of pressing and wrapping, as well as the much longer maturing process, characteristic of a hard cheese. Of course, it’s all still done by hand, as is the family tradition since Selina's father Humphrey Errington started making and selling his Lanark Blue in 1985. Besides Cora Linn, Selina recently took a phone call from a Cumbrian goat farmer with too much goat’s milk on her hands due to a cancelled supermarket order. This was an opportunity to make the Erringtons' latest cheese: Biggar Blue. With the first small batches of goat’s milk cheese successfully sold, this will be the sixth cheese type from the Lanarkshire family that has done so much to make Scottish cheeses serious challengers to continental rivals on domestic and Michelin-starred restaurant cheeseboards alike.